Not a week goes by that I don’t have a conversation with a client or colleague about the frustration and challenge of getting visibility on Facebook in the newsfeed, especially for your Facebook business page. Even Guy Kawasaki (video) is frustrated and doesn’t understand why Facebook doesn’t show your content to the people who have raised their virtual hand to say they want to see your stuff. And, maybe that’s why I’m hearing more and more people talking about moving over to Google+. It’s estimated that only about 10% of the people who follow your Facebook page, actually see your content. So you’re left to spend an unreal amount of time posting pictures, videos, polls and links in the hope that your followers will see and engage with your content. Or, you can spend money and advertise your content with promoted posts and offers in an attempt to get attention in the newsfeed. That’s my strategy. I spend $10-20 per month advertising key posts to my fans. Generally I promote a post with a free offer and use them as lead generation and for list building. If you’re committed to marketing your business on Facebook (and with over 1 billion users, who isn’t? ), the infographic below may help you choose how to engage for the best return on your investment of time. 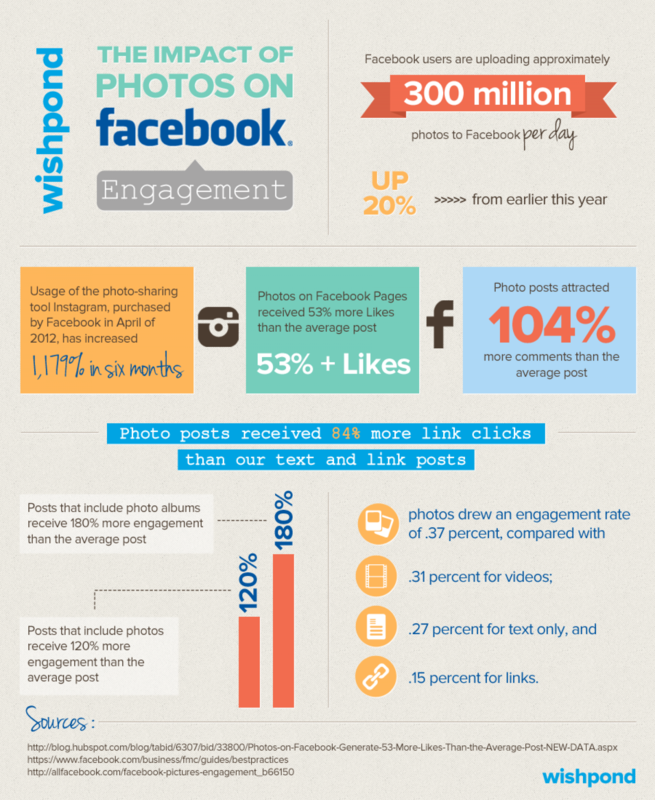 No surprise here that images get the best engagement. Some of the statistics are astounding. A couple of questions for you… do you use images on Facebook and what are your thoughts about the challenges of using Facebook for your business? I’m just getting started with a Facebook page but agree that I’m more likely to interact with a company’s post if it includes a graphic or image of some sort.